Top three spots were decided before the Medal Race. Ruggero Tita & Caterina Banti secured the crown with plenty of margin, sailing a la Besson-Riou the Italian crew showed superior performance. 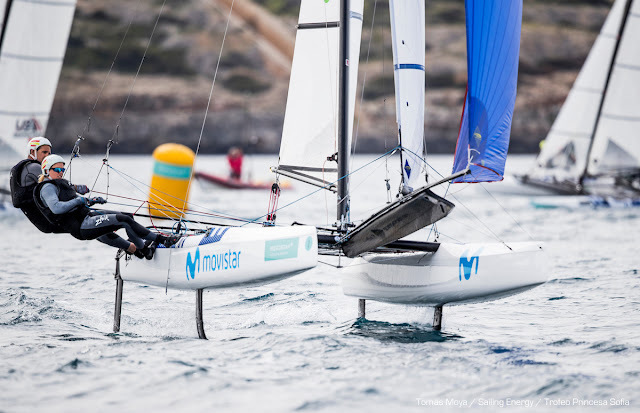 Last year they lost a certain chance to win the Worlds after they hit Iker Martinez boat destroying his mast, a dangerous situation they gladly could recover a move forward to this great win at Palma. Saxton & Boniface finished 26pts behind for second overall, but also had a great event scoring 5 bullets on their own. Echavarri & Pacheco were ahead Iker & Olga Maslivets, the Spanish teams will provide another fight towards Tokyo qualifications. For Rio Ike Martinez was injured and couldn't compete on decisive events. 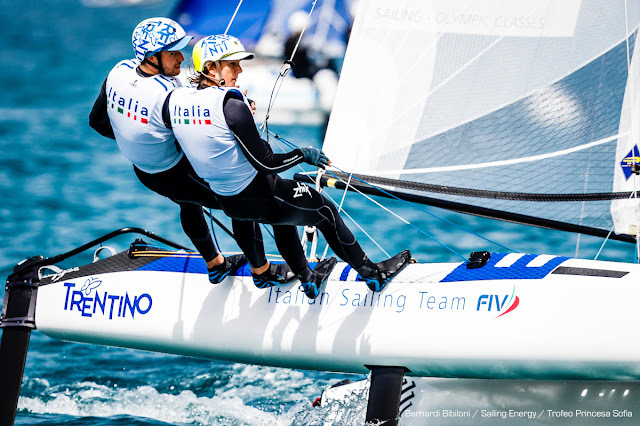 Arg Teams: Maybe for the first time in Santi Lange's Multihull Olympic career he is facing some serious local contenders, Majdalani & Bosco are simply 'disrespecting' the Rio Gold medalists credentials, the youth Arg team is going full forward for the top ten, and were 6th overall before the medal, while Lange & Carranza were 8th. Getting inside the Top ten will provide the kids with more Medal Race stages. Sometimes raw talent is not enough, you need to experience moments of high pressure and learn how to deal with , an aspect Lange & Carranza have mastered by now. In the end this internal fight for Tokyo will benefit both crews, as the Masters will need to stay focused in all fronts and the apprentices will elevate their game with every single regatta. What can we about about Lange and his legacy (his sons won in the 49er fleet at Palma), at his age foiling like the best , along Ceci who has gone throuhg an incredible transition from helong lasers to her actual Gold medalist status and top foiling Nacra 17 crew. Still I foresee for them a similar scenario Bundock had to endure vs Waterhouse & Darmanin for Rio 2016. Trofeo Princesa Sofia Official Report. Australia's world champions Mat Belcher and Will Ryan, outstanding winners of a strong, competitive 470 class, were awarded the Princesa Sofia Trophy, the top overall award at the biggest ever edition, as the 49th Trofeo Princesa Sofia Iberostar concluded in light, hesitant breezes in Mallorca today. The regatta attracted 870 boats from 62 different and more than 1200 sailors. consistent performance, counting all their results inside the top 10 in a high scoring regatta, to win by 39pts ahead of Turkey's Deniz and Ates Cidar. Japan's winners of the class last year at this Balearic showcase regatta Tetsuya Isozaki and Akira Takayanagi finished third. For eight times world chammpin Belcher, winning the top overall award at a personal favourite regatta, one he has been coming to since the first time as a 19 year old in 2001,is a particular pleasure. He wins the class for the fourth time, Belcher acknowledged: " It is really special to win the overall, this a special event to me having first come here in 2001 and so it is a great credit to the place, here, and the organisers to have so many boats here. It is fantastic. We focus on what we need to do but it really is special to win the overall trophy and it sets high expectations for the season ahead. We love this event." The luxury of already having secured their Sofia titles before the Medal Races meant Giles Scott in the Finn, Belcher and Ryan in the 470, Dutch duo Annemiek Bekkering and Annette Duetz in the FX, Italian Nacra 17 pair Ruggero Tita and Caterina Banti and Laser Radial winner Anne Marie Rindom could afford a relatively relaxed approach to their final day. 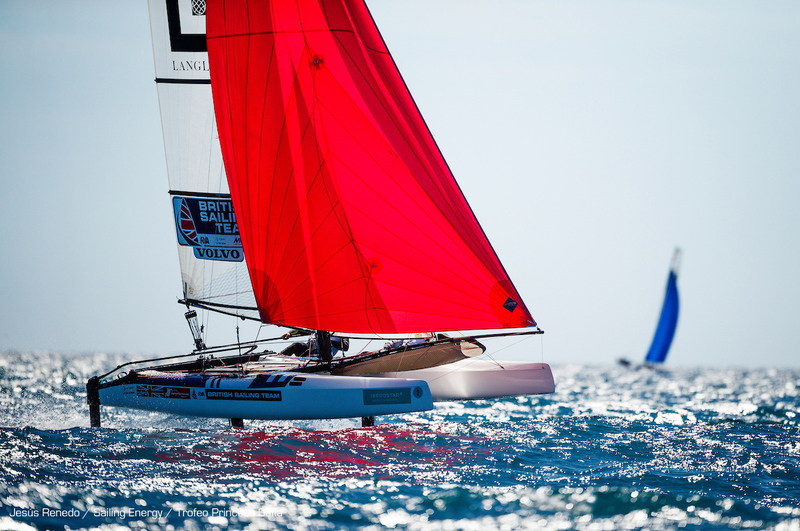 Rindom cruised to sixth in the Radial medal race to win by 15pts ahead of Britain's 2016 world champion. The Danish world champion of 2015 clinched the Sofia title after nine attempts, twice finishing third. "It is not so much about winning here," Rindom reported, "Just now it is about good training and making sure I have good technique. I was working a lot on speed through the winter. If you have speed everything else is easy. Light upwind I have been trying different things and it is coming together." De Gues recalled, "I am going for a medal this time for sure. Every day I look back at that one point, what I could have done better. At first it was really hard and I thought about it every, more times a day, now it is less." "The year after the Olympics I was looking for any distractions, anything to take my mind of it. But I am a bit older and more mature and that helps." "At the Games there was one day when they decided to race inside. We had trained a lot but we had never trained in the conditions we got that day inside. One day we had totally different conditions and I had two results not even in the 20s that was my Olympics. Or the one person I should have passed on a downwind. These are the things that haunt you." She adds, "My motivation is so high and I have learned to train more effectively, better, more productive hours on the water. I trained a lot here. We had a bike camp in the summer and Dutch squad sailors. My boyfriend lives here in the town." The impressive Australian Laser medal machine seems well set to continue as past youth world champion Matthew Wearn topped a very strong fleet including all three Rio medallists. He went into the Medal Race with a 19pts lead and left New Zealand's Sam Meech, New Zealand's Laser bronze in Rio, to second and Croatia's 2016 silver medallist Tonci Stipanovic to third. Australia's Rio Olympic champion Tom Burton was sixth. Three of the Australian Laser sailors finished in the top eight. "The next regatta Tom can come out and do the same thing. That is the way it is in the Laser. It depends on the day. We have a good professional relationship. But we are two guys battling out to be first and second in the world. There are heated moments but we both know we need each other as much we do. To get the edge on the fleet come 2020 we need to work hard together. We have a strong thing going in Australia. We are always, always pushing. It is that competitive mind set. We all always want to beat each other." While Belcher and Ryan topped the Men's 470 fleer Japan proved once again to be in good shape for the approaching home Olympics taking bronze in the Men's fleet and winning the Women's 470 in the shape of Ai Konda Yoshida and Miho Yoshioka. Britain's Hannah Mills, gold medallist now sailing with Eilidh McIntyre took second. "The conditions were difficult but we are quite fast. We have improved every day. We are looking to Aarhus and the world championship." said Yoshida who was fifth in the class in Rio. Argentina's Lange brothers, Yago and Klaus, overshadowed world champions Dylan Fletcher-Scott and Stu Bithell to win the 49ers. The British pair were over the start line in the medal race and had to recover through the fleet, finshing three points adrift. "It was super intense in the Medal Race but we did what we needed to do. It has been a great week for us. There were 90 boats and so the qualifiers were super hard and then in the Finals we had good races in the windy races, average when it was lighter and then today in the Medal Race we were good, getting first. Aarhus is the main goal, the hard work starts here and there is lots to do to keep improving. But right now we will enjoy the win." Yago Lange said. Poland's Pawel Tarnowski made a successful defence of the Palma title he won here last year but he only secured it in the last leg of the Medal Race, passing three rivals in the dying seconds. He dedicated his second succesive Sofia win to his own Zofia, his sister whose birthday it is today. "I told her I would dedicate it to her if I won and I would do my best. So this is for her, my Princess Zofia." grinned the Polish sailor who missed Olympic selection last time by a few points. Great Britain's sailing team collected the biggest haul of medals with five, gold for Scott in the Finn and silvers in the 470 Women, 49er, Laser Radial and Nacra 17. The Netherlands won golds in the FX and RS:X and silver for Nick Heiner in the Finn, New Zealand lifted silvers in the FX and Laser and bronze in the Finn for Andy Maloney. Austrlia won two golds, in the 470 Men and the Laser.